I stopped by the local Wegman's on Friday night to find they had started to stock up on interesting varieties of fall mushrooms. I've usually got a stock of dried morels and lobster mushrooms in the pantry to get me through the bulk of the year, but few things are better than fresh. This isn't counting spring morels, as I find what fresh varieties Wegmans does bring in are pretty dried out or battered from transit. The tiny, golden chanterelles were absolutely perfect. 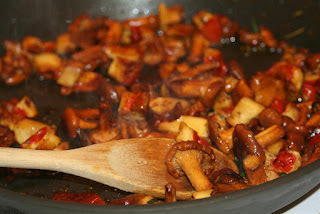 The big, ruddy lobster mushrooms had arrived in great condition, with little breakage of their brick-colored fronds. They also had a nice selection of Royal Trumpet Mushrooms and Blue Foot, which I'm excited to go back to, but nothing holds the woodsy, earthy appeal that chanterelles and lobster mushrooms do. To serve them, I sauteed them in about two tablespoons of butter, with salt, thyme, and a bit of rosemary that's still growing from the hanging planter. For the cooking time, I just let them sit on medium-high heat to drive off the excess moisture from rinsing them, and to start caramelizing the fringed edges. That was it. We ate them tossed with some porcini and herbed ricotta ravioli I had in the freezer from about a month ago. Today we went back for another bagful and just ate them stuffed between pieces of baugette for lunch. Tiny, chewy, buttery and earthy, with a slightly resinous flavor from the rosemary. It was a simple, but lucious way to open the fall season.